This page will discuss exponential and Klopfenstein (and possibly other) tapered transformers. Transformers are used to match one impedance to another (from Z1 to Z2). In most cases, the impedances are purely real (not inductive or capacitive). By tapering a transmission line, a very broadband impedance match (low VSWR) can be realized over a wide bandwidth, the longer the taper, the wider the frequency band. 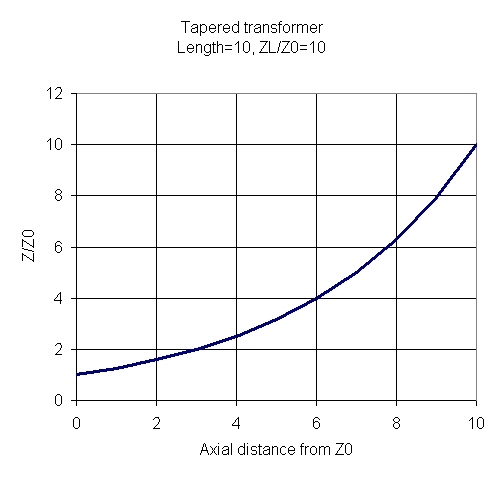 Where z is the distance from the Z0 side of a transformer that has length L.
Here's a plot of the line impedance of a tapered transformer of length 10 (units are arbitrary) that is being used to match ZL/Z0=10. We'll add some more math here so you can see what the impedance looks like over frequency. This topic was contributed by someone at Endwave who prefers not to have his name attached to it. Thanks, Mark! We plan to expand on it in the future, after we look up the 51 year old article. In the January 1956 Proceedings of the IRE, R. W. Klopfenstein presented equations which can be used to design transmission line tapers. "...the Dolph-Tchebycheff taper is optimum in the sense that it has minimum reflection coefficient magnitude in the passband for a specified length of taper". One drawback of the Klopenstein taper is that an impedance discontinuity or step occurs at the ends of the taper.